and remove Red-Eye from human and dog in Digital Photo. Please the image on the left, colorcastdog.jpg and save the big version to your drive. Open the image in Paint Shop Pro 7. 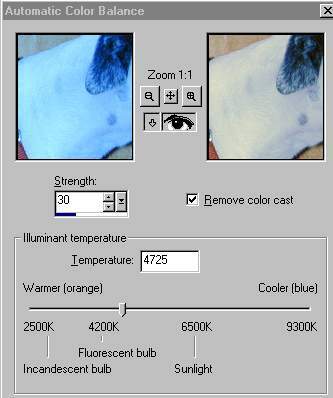 The blue color cast resulted from the camera misinterpreting the white balance or from the white balance being on the wrong setting. I forget now. A simple and quick fix for the color is to change the temperature of the image with Auto Color Balance. On the Menu Bar, go to Effects > Enhance Photo > Automatic Color Balance. 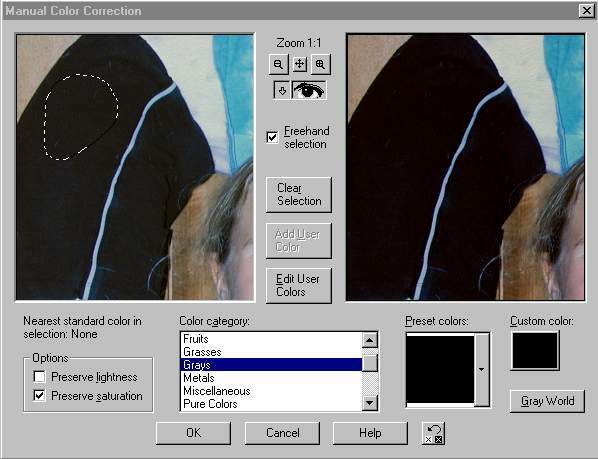 Automatic Color Balance helps remove the color cast from an image. For example, if you have a photograph that has become yellowed with age, you can remove the yellow and restore the original colors. This feature corrects images with several colors rather than for images with variations of one color. Check the Remove Color Cast box. Move the slider towards the left, the warmer side. I settled on a value of 4725 at a strength of 30. Let's fix the tonality (contrast) in the image by making the whites whiter and the black shorts really black. Go to Effects on the Menu Bar > Enhance Photo > Manual Color Correction. Check Preserve Saturation and UNcheck preserve lightness boxes. In the color Category area, pick Grays. From preset colors, pick Gray 00, Black, from the drop down box. Make a freehand selection in the Shorts on the left side of the image as shown below. Notice how the darks get darker in the image. 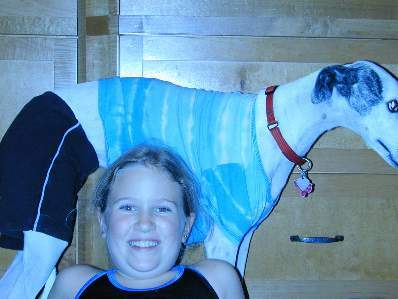 It's already WAY better, as you can see on the left, but lets un yellow the dogs coat by setting the whites. Go to the Manual Color Correction box again. Check only Preserve Saturation box. 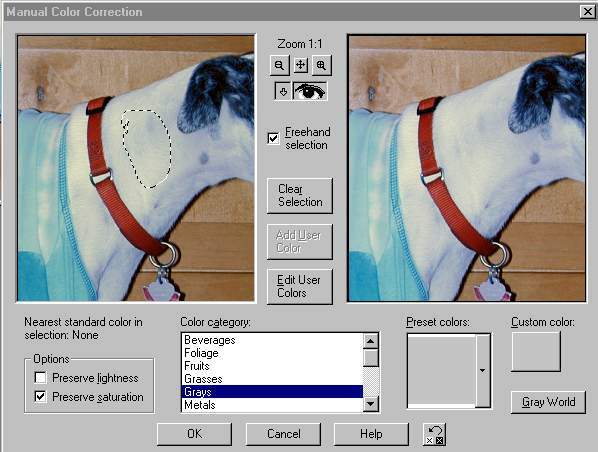 Make a freehand selection on the dogs neck between the collar and the ear, in the white area. See below. From the Preset Colors Pick Gray 16. Notice how the whites brighten and get a bit less Yellow. I think the color is pretty decent in this image now. By using Paint Shop Pro's superior redeye removal tool, we can fix up both the girls eyes and the dogs eye in one swoop. Go to Effect > Enhance Photo > Red eye removal. 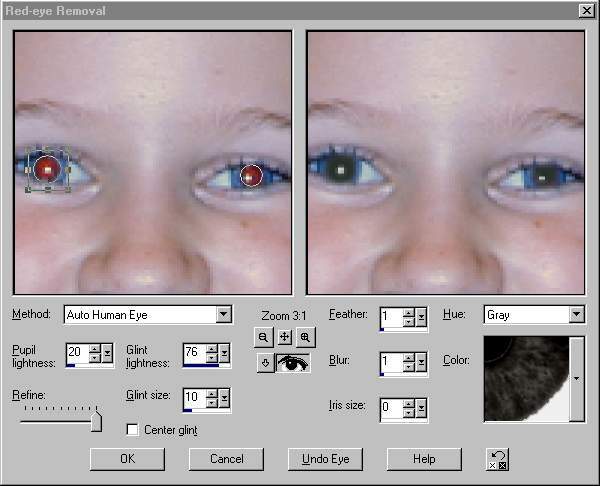 Use the navigator in the middle and the zoom tool to locate and zoom in to the girls left eye. Under the Method box, select Auto Human Eye from the drop down box. In the left side preview, drag a circle over the pupil on the eye. Use the nodes on the sides to resize the circle as needed to cover the whole pupil. Set the following on the dialog box: Pupil lightness to 19, Glint Lightness to 76, Glint size to 10. Make sure the Refine slider is all the way to the right. Uncheck Center Glint. Set Feather to 1, Blur to 1 and Iris size to 0. The Hue of the Iris does not matter since the iris size is 0. Note the effect in the right preview box. Red is gone. Drag the image in the right side preview to show the other eye. 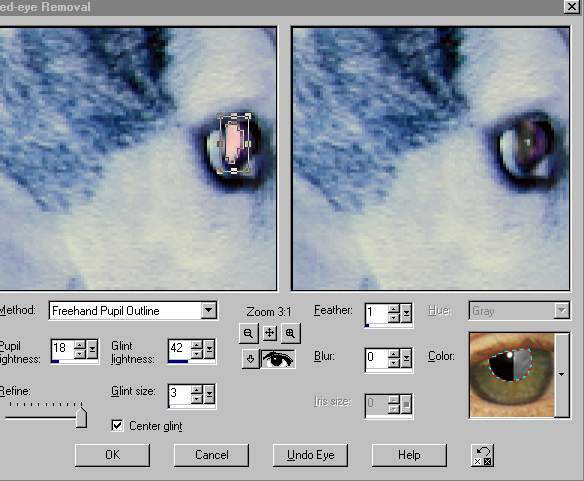 Again, in the left hand preview box, drag a circle over the red pupil. Use all the same settings as the other eye. Note the preview. See below. For the dogs eye, drag right side preview to show its eye. Under Method, pick Freehand Pupil Outline from the drop down box. Set the Pupil lightness to about 18, Glint Lightness to 42, Glint size to 3, Refine slider all the way to the right, Check Center Glint. Feather 1 and Blur 0. Note the improvement in the right hand panel in the screen shot below. When you are done, press OK to apply the red eye removal effect. We are finished with this image. What a difference! Compare the end image above left with the start below left image. I think its pretty amazing what PSP 7 can do with a few mouse clicks to rescue a photos headed for the recycle bin.